Ogden, UT – With more and more skiers venturing into the backcountry alpine touring (AT), or randonée, is the fastest growing ski equipment market segment. To a large degree, however, hard charging alpine skiers have had to sacrifice an element of solid downhill performance in favor of uphill capability if they want to skin to pristine lines. This is the gap that Amer Sports is aiming to fill with the company’s upcoming release announced today of the new Guardian 16 binding from Salomon and the Tracker 16 from Atomic. Five years in development, the two bindings are identical except for labeling and paint jobs, and will first be available to consumers in fall 2012. They’re clearly aimed squarely at the Marker Duke, their nearest competitor in the field and currently the binding of choice for big, burly guys ripping big, burly sidecountry lines. Skiers looking to tour all day will find the binding too heavy for that purpose, but that’s not the market that Salomon and Atomic are aiming for. Unlike the Duke, these new offerings from Salomon and Atomic will feature a Hike & Ride Switch that doesn’t require the user to remove the ski to switch between climb and ski modes, a sometimes dangerous proposition in precarious spots. In fact, the heel piece has been designed using four steel teeth that are spring actuated to retain the heel piece in ski mode. 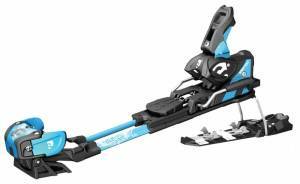 This is intended to eliminate the “heel slop” that commonly develops in a traditional AT binding and also allows the user to simply lower the climbing bar and step down to engage the ski position, much like stepping into a traditional alpine ski binding. The binding’s DIN range will be from 7 to 16 to accommodate the most aggressive skiers on the hill and two sizes of the binding will be available to accommodate different boot sole lengths. It’s designed to be used exclusively with alpine ski boots but the adjustable toe height will allow those with alpine touring boots to reach their own conclusions regarding compatibility. Today’s announcement was long on anticipation and short on technical details, including weight, retail price, stack height (the height of the ski boot sole above the ski) and ramp angle, although both Aicher and Jenny Naftulin, Salomon Alpine Brand Manager, acknowledge that weight and retail price will be “comparable to its closest competitor,” clearly referencing the Duke which tips the scales at a hefty 47.1 oz./1335 g. Stack height is said to be somewhat lower than that of the Duke, which is 40mm at the heel and 32mm at the toe, as the rails of the Guardian 16 and Tracker 16 sit flush against the ski’s top skin. The Duke retails for $495, and the price of the Guardian 16 and Tracker 16 is expected to be announced by the company in about a month. Get our free apps for Android, the iPhone and iPad! All content contained herein copyright © 1994-2019 First Tracks!! Online Ski Magazine. All Rights Reserved.